Tuesday evening the Cleveland Cavaliers play the Macabbi Elite basketball team from Tel Aviv at "The Q" (Quicken Arena). Elissa and I will be at the game along with some teens and staff members from Agudas Achim. On Monday evening, Elissa and I attended a benefit dinner here in Cleveland for the Friends of the Israel Defense Forces. Cavaliers owners Dan Gilbert and David Katzman were honored. I had the chance to meet all the players and coaches from the Maccabi Elite team. Danny Ferry, the General Manager of the Cavs and former Duke Blue Devil phenom, was also in attendance. The best part of the evening, however, was standing next to someone who is an entire foot taller than me - Cavs center Zydrunas Ilgauskas, who is 7 foot, 3 inches. My photos from the evening are online. 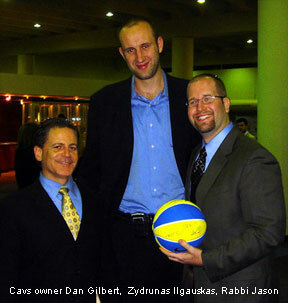 Here's a funny column in preparation for Tuesday's game against Maccabi Elite from the Cleveland Cavaliers' website.